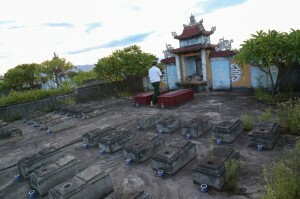 Le Van Dung and his wife Dang Thi Miet have produced thirteen children and buried twelve of them. It’s hard to imagine how one survives such an experience, but they welcome us into their home with warmth and gratitude. Mrs Miet seems exhausted, but has a winning smile. Her husband wears his VAWA badge and his veteran’s red star with pride. This couple has not been demeaned by their loss. We visit their spacious house (which was built and financed by a grant from the provincial Ministry of Labour, Invalids and Social Affairs (MOLISA)) with Tran Van Luan, an AEPD outreach worker. According to Mr Luan, 24 Agent Orange victims are living in this ward. AEPD only started working with the family 6 months ago, and has yet to involve them in any activities. Mr. Dung and Mrs Miet both served in the military during the war. Mr Dung fought, while his wife worked on roads. Mr. Dung was exposed to Agent Orange in Quang Tri province when US forces sprayed the area where he was stationed, leaving the forest burning and Mr Dung gasping for air. Le Thi Ngoc Thuy, the daughter who survived, was born in 1979. She has suffered from a bad memory, depression and headaches ever since and seems quiet and withdrawn. She had two children by her husband, but he left her. Mrs Thuy receives 700,000 Dong a month in compensation and earns a small income from cutting grass. Of Mrs Thuy’s two children, one is free from dioxin poisoning – at least for now. The second child, Le Thi Phuong Thao is full of spirit and moves restlessly from lap to lap as her grandparents talk to their strange visitors. Le Thi Phuong Thao is in the first grade at school and seems smart and curious, but her teacher says she has a bad memory and a grade point average of around 6 out of 10. Her eyes are an even bigger problem. Le Thi Phuong Thao’s eyesight has been deteriorating steadily since she was born and is now functioning at around 70%. She goes to Hanoi every six months for a check-up and new glasses. But she cannot have surgery until she reaches the age of eighteen, so she is in a race against time. 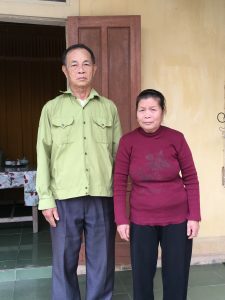 The family assumes that Le Thi Phuong Thao’s medical issues were caused by dioxin, and she is listed as a victim of Agent Orange by MOLYSA, the government ministry. In spite of this, the family gets no money for Le Thi Phuong Thao because government compensation does not extend to the third generation. We meet one other member of this family whose life has been ruined by Agent Orange. 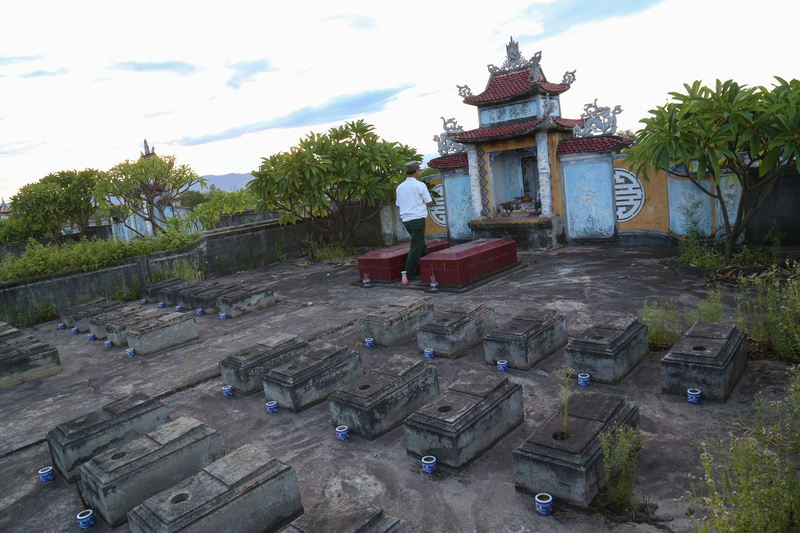 Le Minh Duc, 12, is the son of Mr Dung’s younger brother, now deceased. Duc is in a wheelchair was certified by the government as an Agent Orange victim in 2012. His leg was operated on three months ago. He seems extraordinarily frail. As with the other Agent Orange families we met, the Dung family is struggling to pay the bills. Mr Dung and his wife each receive 1.9 million Dong a month. Their daughter receives 700,000 Dong, and their nephew Duc receives 600,000 Dong. But it costs 5 million Dong each time they take Le Thi Phuong Thao to Hanoi for her medical check-up every six months. AEPD is helping to identify options. The family is a member of a local AEPD self-help group and Mr Dung appreciate the company: “I like to sing together and meet other members. They have raised funds to help us.” They are also thinking of how to earn a living. Le Thi Ngoc Thuy, the daughter, dreams of buying a sugar cane machine which will allow her to press the cane and make a popular local drink that she could sell outside schools. There is also plenty of rich farming and available in the area. A buffalo would certainly help, says Mr Dung. Last Friday I had the privilege of meeting three more of the Advocacy Project’s beneficiary families here in Quang Binh Province, families that have been ravaged by the effects of Agent Orange. With AEPD outreach worker Mr. Thuan, staff member Ngoc and AP associate Dat, I headed out to meet the families of Le Van Dung, Pham Thi Do, and Le Thanh Duc. These are all families that have already received funding through the generosity of AP’s donors, and I’m mainly visiting to check up on how everyone is doing and how the businesses that AP has helped them start are faring. However, I would soon be reminded that AP’s support, while welcome, is no shield against misfortune. Le Van Dung and his family live in a neighborhood on the outskirts of Dong Hoi, the provincial capital where AEPD is based, so it only takes us around 10 minutes to reach him. Mr. Dung and his wife, Dan Thi Miet, live in a house typical of the area—it has several rooms and a front courtyard. We sit down with Mr. Dung in the foyer/living room of his house; Mrs. Miet also joins us, but Mr. Dung does most of the talking, a pattern I’ve seen in other families here. As explained in greater detail here, Mr. Dung and Mrs. Miet both served in the North Vietnamese military during the American War, with Mr. Dung seeing active combat. While fighting in Quang Tri Province, close to the border between North and South Vietnam, US forces sprayed the dense jungle sheltering his unit with Agent Orange, exposing them to the poison. Mr. Dung and Mrs. Miet attempted to build a family after the war ended, but tragedy haunted them as 12 of their 13 children died in infancy. Their surviving daughter Thuy (who lives elsewhere in the city) and Thuy’s daughter Thao have experienced illness linked to Agent Orange. Mr. Dung bought a cow and calf with AP funding earlier this year, and he tells me that not much has changed since then—both are developing “very well.” He’s had to work a bit harder to take care of the animals and plant grass for them to eat, but it’s “not too hard,” and the additional income is well worth it. 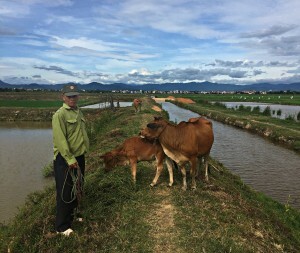 Mr. Dung can’t have a full-scale farm in the city, so instead he hopes to raise and sell the calf, breed the cow again, and use the cow’s manure to fertilize the plants he does have. Last year we’d planned to buy him a cow and a sugar cane press, which he could use to produce sugary drinks to sell from his home, and I ask him why he changed his request. Mr. Dung says that he wanted to earn money from a new source, and that he believed a calf would allow him to earn more money more quickly. Since his home is on a side street, Ngoc says, it’s not a good location for selling drinks. Mr. Dung says he’s still hoping to get a cane press for his daughter Thuy (who sometimes suffers from headaches and depression but is otherwise healthy) so she can open a business of her own, but his own health is fragile enough that he doesn’t want to create more work for himself right now. Mr. Dung tells me that Agent Orange has contributed to the worsening of his health—he’s developed a “heart condition” (Ngoc clarifies that this is not a heart attack) in the last year and now relies on medicine to keep going. He shows us some of the medications he takes—it seems like a lot for one man. The couple’s granddaughter, Thao, lived with them during our last visit, but Mr. Dung says she’s living with her mother now. 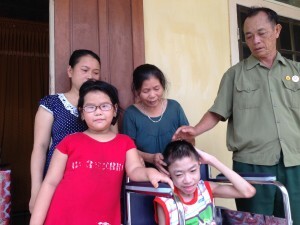 They’d previously taken in their nephew Duc, son of Mr. Dung’s late brother, who also suffers from Agent Orange poisoning and is confined to a wheelchair—since the spring, however, Duc has lived with his own mother. Now it’s just Mr. Dung, Mrs. Miet, and their other granddaughter Nan living here; Nan is with other relatives for the summer holidays, so we don’t get to meet her. Thao’s eyesight is slowly deteriorating, and Mr. Dung tells me that hasn’t changed since our last visit. Mr. Dung took Thao to see a doctor in Hanoi, who said that Thao can undergo surgery when she turns 18 (she’s 9 now) to try to reverse these effects, but it’s possible that by the time she’s old enough for the procedure her eyesight might be totally gone. Mr. Dung and Mrs. Miet are hoping that Thao’s sight will last another nine years, but Mr. Dung says it’s not entirely certain the surgery will work even if that happens. Nan, meanwhile, has developed kidney disease in the last few years (she’s 14), which they are treating with traditional remedies; it’s unclear whether this has any connection with Agent Orange. After I take photos of the couple and the house, we leave and travel around a quarter-mile to a large collective farm field to see the cow and calf. While traversing the field we see—and hear—a passenger jet passing overhead; this neighborhood is very close to the Dong Hoi Airport. Dat later informs me that Mr. Dung complained of gasoline fumes from the airport, and of airplane noise disturbing the family’s sleep. They’ve complained to the local government, but there’s little to be done. We see the cow and calf, who indeed look healthy as they graze peacefully in the field next to a large rice paddy. As we prepare to leave, Ngoc tells me that this is the last collective rice field in Dong Hoi, and that there are plans to develop the area to accommodate the growing city. “If they get rid of these fields,” I ask, “what happens to the animals?” She shrugs. AP first met the family of Mr. Le Van Dung in 2015. They have suffered terribly from Agent Orange, as 12 out of their 13 children have died. 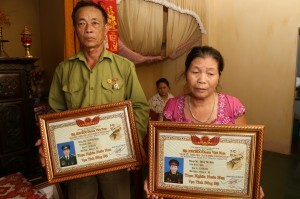 The only daughter still alive, Le Thi Ngoc, has two children – they too are victims of Agent Orange. This family was supported by AP in 2016 with one cow and a calf. The father of Ai Hoang (2016 Peace Fellow), raised the funds to support this family and came to Vietnam to deliver the money himself. He gave them 20 million dong, and the family contributed with 3 million themselves to buy the two animals. They tell me the animals are healthy, but they are still maturing so there are no offspring yet. They use the cow’s fertilizer for their garden, where they grow vegetables, like sweet potatoes and greens. They use the garden mostly to feed themselves, but sometimes they sell products to neighbors, for a little money (around 20k dongs a month -$1). Mr. Dung tells me that they’ll keep the animals and their offspring for “emergencies”. This scenario seems to be common among our beneficiaries, who are relieved to have a reliable source of money in case they have sudden medical needs. The couple looks old and fragile so I ask if they get any help from their community. Mrs. Dang Thi Miec does all the gardening but their relatives are the ones taking care of the cow and calf. The animals live in the rice field with the relatives, so I don’t see them on the property. Mr. Dung tells me their grandson, Le Hoai Nam also helps with the animals. I ask more about their family’s health. Mr. Dung tells me he has a “heart problem”, which he takes medication for. He also mentions he has fertility problems since 12 of their children died. He receives 1.5 million dong per month in compensation but has to pay 700k dong per month on medication which is not covered by insurance. His wife, Mrs. Miec is also an Agent Orange victim and also a war veteran. She tells me she’s had many operations to remove tumors from her throat, bones, and back. Now she has the usual symptoms of first-generation exposure – headaches and joint pains. She receives 1.7 million dong per month as compensation. Both husband and wife joined the army in 1969, which makes them eligible for compensation. Their daughter, Le Thi Ngoc Thuy (39), was born very weak and has ”unstable health”. Mrs.Miec tells me she cannot do hard work, such as work in the field. She receives 800k dong per month as compensation. Her eldest child, Le Hoai Nam(15), is from her first marriage and lives with Mr. Dung and Mrs. Miec. Their grandparents tell me he sometimes gets violent and “his mental state is not great”. Ngoc, my translator, tells me “he is not all there”. I ask about medication and they say when he gets too violent they take him to the hospital for treatment. The second grandchild, Le Thi Phuong Thao (10), lives with her mother and father, who is Thuy’s second husband. She is short-sighted and has been wearing glasses since she was very young. Mr. Dung tells me her vision is deteriorating and is now down to 70%. Apart from that, Le Thi Phuong Thao cannot concentrate in school. Both grandchildren were denied AO compensation. Unlike other supported families that we’ve visited, the cow and calf didn’t seem to relieve any of the burdens of Mr. Dung and his wife. Having a more stable economic situation won’t stop their grandchildren from suffering from AO effects. Mr. Dung and Ms. Miet warmly welcome us into their home. Mr. Dung is sporting his veteran’s cap and pin on his shirt. He pours us tea as we sit around the table. Although Ms. Miet sits behind us, she is just as engaged in the conversation. Both Mr. Dung and Ms. Miet joined the army prior to 1969 and were directly exposed to Agent Orange. The exposure has had a significant impact on their family’s health including their children and grandchildren. The reach Agent Orange poisoning has had on this family is harrowing–12 of their 13 children suffered and died from its effects. Their surviving daughter and two grandchildren are also victims of Agent Orange. Mr. Dung has little to report about his own health. He remarks that he is aging but otherwise it is unchanged. Before saying anything else he begins to talk about his wife’s health condition. It is obvious that Mr. Dung is severely concerned for his wife’s wellbeing. Ms. Miet had a surgery to remove a tumor on her back within the last two years (they weren’t exactly sure the date). Unfortunately, she stills feels pain when the weather changes. She is currently feeling pain in her neck. Ms. Miet has a goiter and the doctor has advised her to have surgery to remove it but they cannot afford it right now. 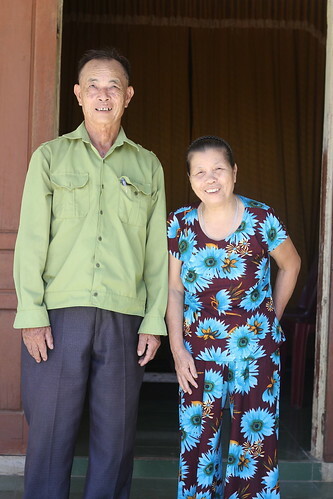 Despite these difficulties, Mr. Dung and Ms. Miet seem optimistic and determined to care for their daughter and grandchildren’s health above their own. Le Thi Ngoc (39 years old) is the couple’s only surviving daughter. Like her two children, she suffers from the effects of Agent Orange exposure. Since Karen’s visit, her health has not changed. Ngoc’s daughter, Le Thi Phuong Thao, is 10 years old. She does not receive Agent Orange compensation as a third generation victim. The exposure has most severely affected her vision. It has worsened since January. Thao is treated regularly at the Dong Hoi eye center but her condition has worsened beyond their ability to most effectively treat her. She has had to go to a specialist in Hanoi twice this year. Thao is eligible for an eye surgery that will significantly improve her quality of life but must wait until she turns 18. As such, she will continue to rely on the medication to treat her symptoms for the next eight years. Because of their age, Mr. Dung and Ms. Miet’s income is primarily derived from the compensation they receive from the government. They are unable to farm and live from the vegetables, fruits, and herbs grown in their garden. 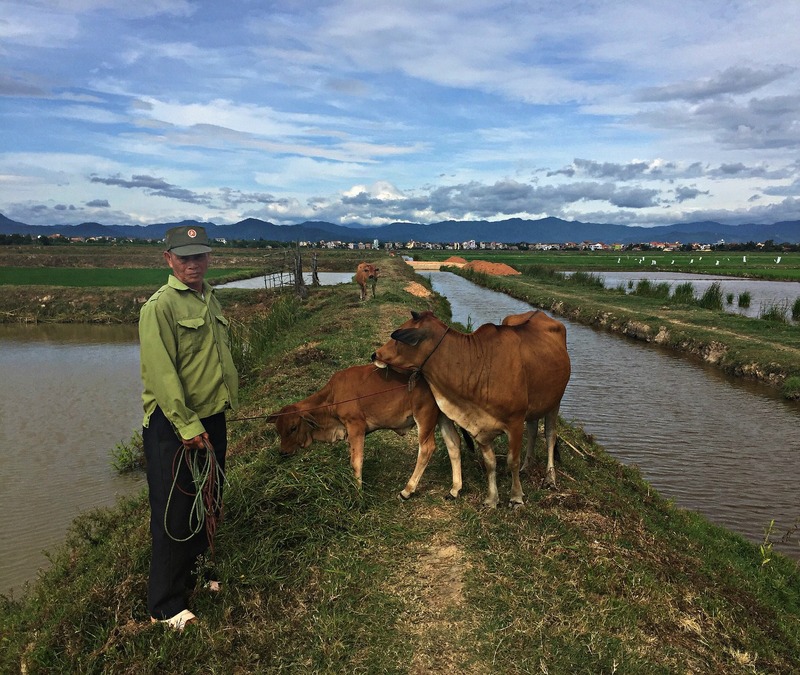 Mr. Dung and Ms. Miet received a cow and calf in 2016 from Peace Fellow Ai Hoang’s family. Both animals are growing well and the cow is scheduled to breed once the calf has been weaned. Mr. Dung plans to sell either the cow or calf to purchase a motorbike for Le Hoai Nam (his grandson) to go to school. Nam lives with Mr. Dung and Ms. Miet. He is Ngoc’s son and suffers from mental disabilities related to Agent Orange. He experiences violent episodes when the weather changes. Mr. Dung adds that these episodes do not happen regularly. A motorbike would greatly help the family’s situation. Mr. Dung and Ms. Miet also genuinely seem excited to gift their grandson a motorbike and look forward to it. The couple believes they will sell the mother cow because the calf has greater potential for future breeding (due to her excellent physical qualities). They estimate the mother cow will sell for approximately 18M VND but will wait for the calf to grow for at least 2 more years; the calf is currently valued at 10M VND. Ultimately, however, their choice will depend on market price and need. Unfortunately, their current needs (motorbike, goiter removal surgery, etc.) are greater than the potential profit of one cow and they must prioritize their needs. Mr. Dung and Ms. Miet will continue to meet with an AEPD Outreach Worker. When the time is right (based on market price and calf maturation), AEPD and the Le family will discuss cow sales. They are transparent about their intentions and trust AEPD to guide them in their business plan. It’s heartening to see the rapport AEPD has built with them and how invested the Campaign and the couple are in the future of their business plan as a sustainable source of revenue creation. Although their need is greater than their income production, the Le family remains hopeful.